Prof. Edward Hanna from the University of Lincoln in UK is a world leading scientist in Polar climate. 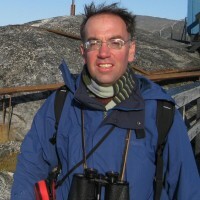 He has extensive experience working on ice sheet mass balance and interactions with climate change and public understanding of science, especially in meteorology. His current research activities have also significantly contributed to the investigation of possible links between Arctic amplification and the occurrence of extreme weather in the Northern Hemisphere mid-latitudes. These are research topics at the forefront of international research. His two lectures and the following discussions with students and scientists from Nansen Centre and Bjerknes Centre have taken the initiative for potential collaboration. There are several activities, such as joint proposal to KLIMAFORSK call 2018 and joint research papers on daily Arctic amplification episodes have already started after his visit. We see this as a fruitful research visit, and hopefully will be able to strengthen the collaborations in the near future. We were excited to host Dr Michele Petrini, from Delft University of Technology (TU Delft) in the Netherlands as a Bjerknes Visiting Fellow for a 5-day visit to Bergen in June 2018. Michele is a numerical ice sheet modeller specialising in palaeo-ice sheets. He recently joined the team of Dr Miren Vizcaino on the ERC-funded Project CoupledIceClim where he is working to simulate the deglaciation of all northern hemisphere ice sheets since the Last Glacial Maximum within a transient coupled ice sheet–climate model framework. During his visit we discussed climate-ice sheet model development, results from his ice sheet modelling simulations of the Barents-Kara Ice Sheet, nuances of the glacial geological record in the eastern Barents Sea, and methods for data-model comparison using the DATED-1 reconstruction of the Eurasian ice sheets based on geological data. It was a stimulating research visit for all of the RISES team and we look forward to on-going collaboration with Michele in the future. 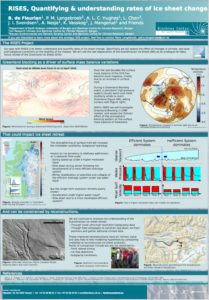 Michele presented result from his PhD work to model the evolution of the Eurasian ice sheets during a BCCR-GFI seminar: Ice stream sensitivity to ocean warming of the simulated Barents Sea Ice Sheet during the last deglaciation. 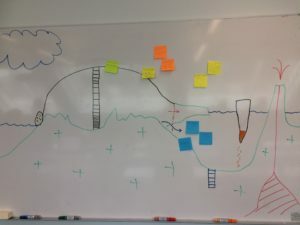 As part of the Hazards Theme group at the Bjerknes Centre, we started a working group on ice sheets and sea level, using the strategic project RISES as a hub. On Friday May 4th we had a workshop with 6 excellent presentations on topics related to ice sheets. We learned about: 1) using volcanic ashes for precise synchronization of sediment and ice cores; 2) the onset of the Little Ice Age and its atmospheric signature; 3) all the factors that sum up coastal sea level change; 4) various methods for understanding ocean-ice shelf interactions; 5) a new (pancake) ice sheet model incorporating oxygen isotopes; and 6) the spatial distribution of the oxygen isotopic composition in accumulation over the Greenland Ice Sheet. After the presentations we discussed key challenges for our ice sheet related research, indicating the need for the implementation of oxygen isotopes, ice sheets, ice shelves and ice-ocean fluxes in NorESM, better chronology/synchronization methods for (proxy) data, focus on uncertainty estimates from data and models, and improved bathymetry data. Thanks to the presenters Sarah, Willem, Even, Elin, Andreas and Anne-Katrine, and all other ~25 participants for making this workshop a success! 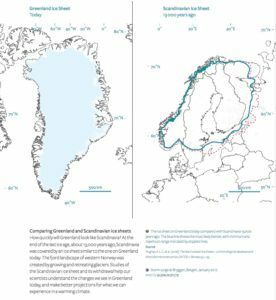 As part of the Hazards Theme group at the Bjerknes Centre we started a working group on ice sheets and sea level, with the strategic project RISES as a hub. 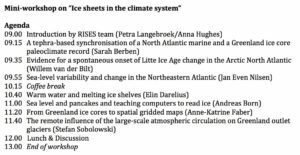 Our next activity is a mini-workshop focussing on the interactions between climate and ice sheets. The workshop will take place on Friday the 4th of May at 9-13h in the BCCR seminar room, and we are very happy to announce a great list of BCCR speakers (see agenda above). Our RISES project was beautifully portrayed in the annual report of the Bjerknes Centre 2017-2018. Click here for the link to the full report. Basile presented our project on the annual Bjerknes Centre meeting, 10-12 of January 2018. First presentation of our 4 years strategic SKD project during the Bjerknes days in October 2017. We (Linling Chen, Basile de Fleurian, Anna Hughes and Petra Langebroek) are happy to have this great opportunity to study ice sheets, their stability and how they interact with climate.